Mr. Joshi, a senior citizen is worried man today. His income from FD has been getting less by the day and on other hand monthly expenses have been rising. To add to the worries are the rising medical expenses. For the generation that has retired in last few decades, retirement pension or interest income from FD was the income support in old days. Changing times call for different approach. A good mix of fixed income and market linked products is the answer to ensure optimal investment returns. Investing Rs 15 lakh in Pradhan Mantri Vayu Vandana Yojana provides assured return of 8% with monthly income of Rs 10,000. Investments in debt and balanced funds schemes can give higher returns and better protection of capital. These investments are tax efficient if invested over three years. A small exposure to equity mutual funds over 3-5 year horizon can provide for capital appreciation. The increased returns should also be used for having adequate insurance cover to meet medical expenses. A small sum in liquid fund for emergency needs can take care of any contingency. Are your bank FD safe with PSU banks? The recent news of Bank scams and huge losses incurred by banks are making the common man jittery over the safety of one’s hard earned savings. Bank FD is the most natural option used by salaried class to park their savings to provide for the future needs. One, because the nationalised banks are owned by the government and its was indirectly a guarantee that your funds are in safe hands. Whenever there has been a doubt about the viability of a Bank, RBI has stepped in and ensured safety of investor deposit by merging of weaker banks with the stronger ones. 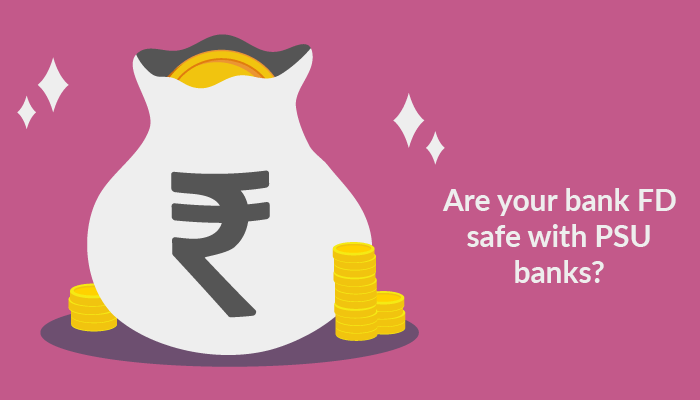 Let’s have a look at the regulatory provisions to know how safe your deposits are. Bank deposits in value terms are insured by the Deposit Insurance and Credit Guarantee Corporation of India (DICGC), a wholly owned subsidiary of the RBI. The deposit insurance covers all commercial banks, local area banks, regional rural banks and cooperative banks. You should be aware that only Rs 1 lakh of your savings is insured. This limit has not been revised since long. As an investor you should also know the worst-case scenario in case something untoward happens.